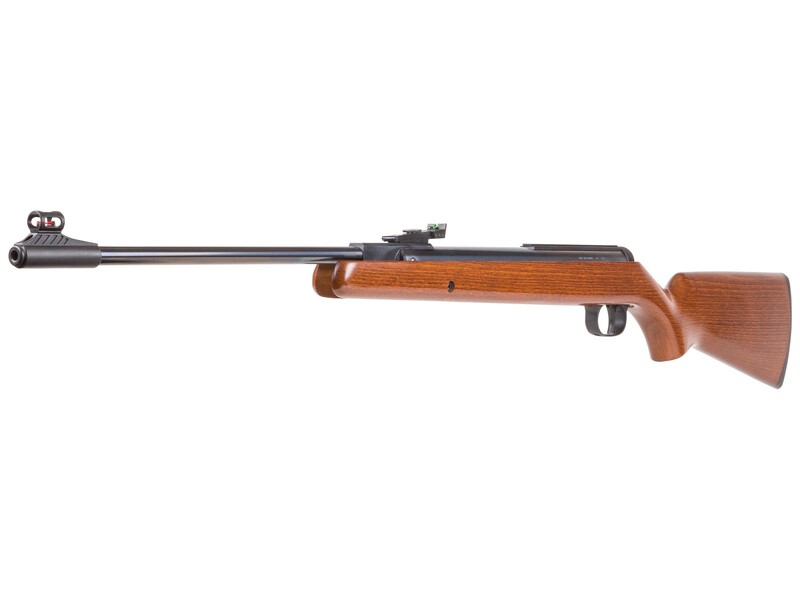 Looking for an accurate, consistent and reliable spring piston, breakbarrel air rifle? Then look no further than the Diana 34 - a time-tested classic and the German manufacturer’s most popular model - for good reason. 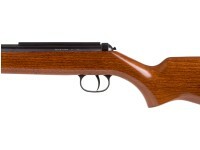 From its well-balanced, beechwood stock and easy-on-the-elbows, 33 lb. 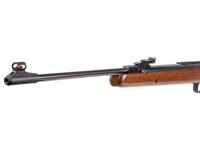 cocking effort, to its high-quality, rifled steel barrel and adjustable, two-stage trigger, the Diana 34 is packed with features often found in much-higher priced guns. Things I liked: This is my second RWS Diana 34. 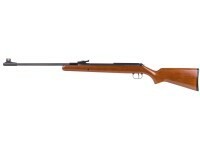 I bought another due to how much I love these rifles. 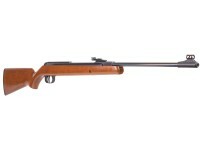 It is hands down the best and highest quality rifle for the money. It is a German made springer and will last you a lifetime. The accuracy is phenomenal....period. 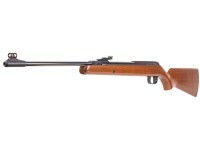 In the .22 cal it also has more than enough energy for any small game. 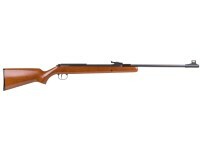 In the .22 it is a 16.5 - 17 FPE rifle. What others should know: The 34 is very easy to take down and do whatever you may want or need to do as far as lubing or tuning. But DO NOT do so without a spring compressor. There is a lot of tension on the spring. Things I liked: I bought mine off Ebay, it was listed as a "shelf pull", with the only defects being a small ding in the stock and missing elevation knob. When I got it, the bracket that holds the front of the stock on had a screw broken off in it. I contacted Umerex, they wouldn't warrent the exterior, so I had to buy a new bracket along with the elevation knob and elevation spring for the sight. I also ordered 2 new stock screws, but instead they sent me 2 barrel pivot screws. I found the tiny ball bearings (2mm) that go under the elvation knob from a local gunsmith, and bought 2 cap screws for the front of the stock, and changed the toothed lock washer to flat washers and lock washers. They won't stay tight. I will cut grooves in the underneath surface of the cap screws to see if that won't hold with the toothed washers. It is very accurate tho after fixes, shooting same hole groups with cphp and JHB heavies at 10 yards. Things I would have changed: A steel rear sight with tighter fiber optics. there is too much side-to-side space in the rear notch for the front sight. A tune at the factory would greatly improve shooting dynamics. It needs velocity tar on the spring, a buttoned piston and polished washers under polished spring ends, and a tight steel spring retainer. It shoots like shaking a coffee can full of nuts and bolts and rings like a bell. After a tune, it would be like shaking a coffee can full of rice with no ringing. I feel like there is a good chance of breaking a scope with all that vibration. After a good tune, a scope would have a much better chance. What others should know: It took some diddling, but I got the trigger adjusted where there is about 1/4 inch of first stage with a light but safe second stage. Its ideal for me, and with only about 200 rounds through it with open sights, I can tell I will be shooting shotgun primers set in cardboard from 10 yards or so. A good 4th of July activity. A good value overall and even with the extra money I had to spend it is still a .bargain. Things I would have changed: Rear sight, better manual would be nice as the directions for adjusting the trigger are clear as mud. When I got my red 34 the sights did not adjust high enough for me to sight in the rifle. Later I mounted a utg scope mount and scope. The rifle was working fine until the barrel started getting stuck and not being able to break currently it is stuck should I just oil the moving parts or what should I do??? Do these have the Diana huntress logo below the Rws logo, or just the Rws logo? When out hunting, how long can you keep the RWS/Diana cocked before losing power or harming spring?